Hermir Strong-Heart is a Nord blacksmith who works at the outdoor forge in Windhelm. She works alongside Oengul War-Anvil as an assistant and the two can often be heard talking about various things relating to their work. If Oengul dies, Hermir takes over running the Blacksmith Quarters on her own. Hermir begins her day at 6am by having breakfast within the blacksmith quarters. After a leisurely two hour breakfast, she will head outside to work at the forge for the next twelve hours. At 8pm she will return inside for another two hour meal, before heading to bed for the rest of the night. At 6am she will awaken once more, to repeat her schedule. She wears iron armor, boots, and gauntlets. She also carries an iron dagger, a key to the blacksmith, and a selection of common items and gold. She thinks very highly of Ulfric Stormcloak and his rebellion and strongly opposes the Empire. She will frequently comment on her personal admiration for the leader of the rebellion in passing: "I never expected Ulfric to live up to his legend, but he does." She will also reveal the joy she experiences by just getting to see the Nord: "Working in Windhelm is great. I get to see Ulfric up close." Hermir will also provide praise to her master, Oengul, on occasion: "I couldn't ask for a better teacher than Oengul." Pointing out her clear devotion to the Jarl of Windhelm will have her respond that all Nords should share in her fervent support of Ulfric: "Every Nord should admire Ulfric. He fights for all of us. 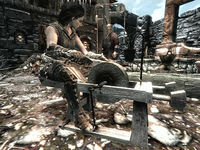 In fact, he's the reason I chose to learn the smithing trade. I want to make weapons and armor for the great Stormcloak army." 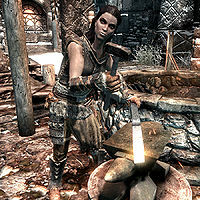 Questioning her about her chosen career as a blacksmith will have her explain her motivation to assist the Stormcloaks in any way that she can: "Smithing isn't the most exciting thing for me, but we all have to lend a hand as best we can. If a Stormcloak uses one of my swords to strike down an Imperial soldier, then I've done my part to free our land." When ending a conversation with Hermir, she will direct you to speak to Oengul if you need merchant services: "If you've need of weapons or armor, come back and see Oengul." She will also recommend you avoid potentially untrustworthy equipment: "A word of advice -- don't buy discounted armor." If you join the Legion and defeat the Stormcloaks she will start to dislike you. With Ulfric dead, she will make a few solemn remarks about his loss, such as: "I just can't believe that Ulfric is gone. Skyrim will never be free now." or: "Ulfric was a true hero of Skyrim. He will be missed." She will also continue to show her loyalty to the now admittedly hopeless rebellion if asked about it: "I make no secret of it. I don't care if the Empire controls the city or not, I won't hide my loyalty to the dream of a free Skyrim. Ulfric fought for that dream with more courage and honor than any Nord who ever lived. But now he's gone, and the dream is gone with him. But I'll be ready when a new leader takes up the cause. As sure as ice is cold and stone is hard, I'll be ready." Oengul: "Don't even bother with that one. Leave it to the orcs [sic]." Oengul will comment that Hermir has become a talented smith under his tutelage: "Hermir's become a decent smith. Like to think I had a hand in that." He will also make reveal that Hermir is the reason he is willing to stay in Windhelm if you ask him if he will stay in the city now that Ulfric is dead: "I almost didn't. I wasn't sure I could stomach having some Imperial tell me how to live my life. I was ready to pack my things when Hermir came to me. She wanted to make sure I'd finish teaching her the smithing trade. That girl's determination won me over. I suppose it didn't hurt that she said she only wanted to learn from the best smith in Skyrim. I couldn't let her run off to that pretender Eorlund Gray-Mane, could I?" He will say the same on occasion in passing: "Can't believe Ulfric's gone. If not for Hermir, I'd have left the city by now." Although the Official Game Guide lists Hermir as an adept-level trainer for the Heavy Armor skill, the game guide is incorrect. She does not actually provide any training. This page was last modified on 18 October 2018, at 07:26.